SQA were invited to attend Digital Scotland’s Connecting the Unconnected conference in Inverness on Wednesday 26 April. It was a very interesting event with speakers from a variety of organisations including Scottish Government, SCVO, Highland Council and Google. We were there to showcase our Digital Learning Guides and there was a great deal of interest from all who dropped by the stand, including DWP/Jobcentre staff, housing authorities and third sector/charity organisations. The event was hosted by Martyn Wallace, Chief Digital Officer for the Scottish Government Digital Office and the main focus of the day was strategies for engaging with people who are currently not online. Talks covered a wide range of subjects from broad digital participation research to specific initiatives for delivering digital services to the public, and there was a panel discussion on digital inclusion and supporting digital participation both for individuals and in communities. 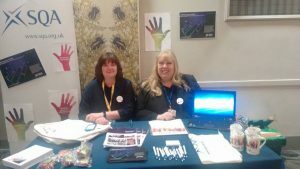 It was a busy and interesting event and we received a lot of very positive feedback about the learning guides and their use in helping engage with people who have never been online before. 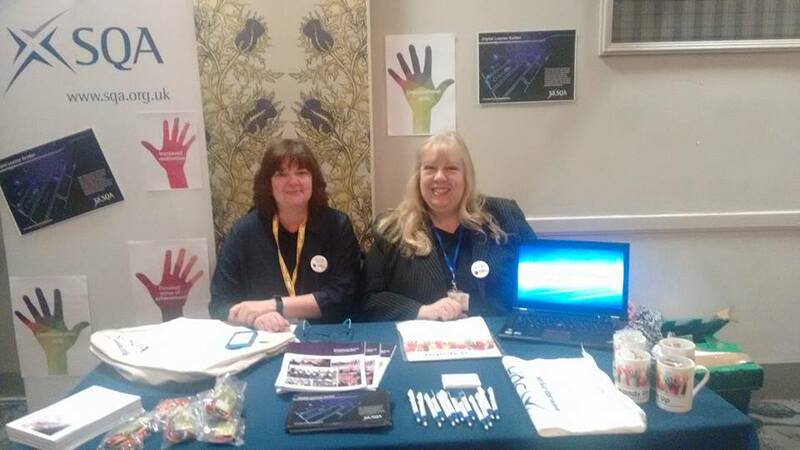 One of SQA’s digital volunteers, Louise Wright, helped to ‘man’ the stand and this gave her a good opportunity to talk about her digital volunteering and its impact on the people she worked with, using the guides as a resource to help increase confidence and learn new skills. The digital learning guides can be accessed here. All ready for our first visitors!